For nearly the first 150 years of the American Republic, the Senate essentially served as a rubber stamp that confirmed nominees with little to no fanfare. Some of these nominees ranged from those who never graduated from law school (including the famous Benjamin Cardozo, who attended Columbia University Law School but did not graduate), and others who were slave owners who would have to rule on the bitterly contested Fugitive Slave Act (Chief Justice Roger Taney, the author of the Dred Scott decision of 1857, among other slave owners or former slave owners on the bench). No, contentious Supreme Court confirmation battles are of fairly recent vintage, and have only very recently become more and more consistent. In 1967, when President Lyndon Johnson appointed Civil Rights icon Thurgood Marshall to the Supreme Court, a vocal crew of southern segregationist Democratic Senators etched their names into history by voting against the first Black American nominated to become an associate justice. Those senators who voted no included Robert C. Byrd (D W.Va.), Strom Thurmond (R S.C.), James O. Eastland (D Miss); Allen J. Ellender (D La); Sam J. Ervin Jr. (D N.C.); Lister Hill (D Ala.); Spessard L. Holland (D Fla.); Ernest F. Hollings (D S.C.); Russell B. Long (D La. ); John J. Sparkman (D Ala.); and Herman E. Talmadge (D Ga.). (Nota Bene: Five Southern Democrats did vote for Marshall, including A.S. Mike Monroney (Okla.), J.W. Fulbright (Ark. ), Albert Gore (Tenn.), Ralph W. Yarborough (Texas), and William B. Spong Jr. (Va.). Marshall would go on to serve with distinction until 1991. Robert Bork, pictured above with President Ronald Reagan, was nominated by Reagan in 1987. The pick drew swift rebuke from the NAACP and the American Civil Liberties Union for a lifetime of positions and opinions that suggested that he was hostile to civil rights (supported the rights of states to apply the racist poll taxes for voting) and equal rights for women. Bork was defeated in the Senate; 42 senators voted yes, and 58 voted no. His name, ever since, has become a verb as to “Bork” a candidate means to defeat his or her nomination. While Bork was, well, “Borked,” only to find Anthony Kennedy successfully confirmed in his stead, Reagan’s third pick (Sandra O’Connor being the first), was the arch conservative Antonin Scalia. Scalia, who would later become one of the most polarizing figures in Supreme Court history, was confirmed with a 98-0 bipartisan vote. There has not been a unanimous confirmation like this since. Thomas was narrowly confirmed by a 52-48 vote. 41 Republicans and 11 Democrats voted to confirm Thomas, while 46 Democrats and two Republicans voted no. In the decade after Thomas’s confirmation hearings, Presidents Bush (41) and Bill Clinton nominated David Souter and Ruth Bader Ginsburg to the Supreme Court. Souter was confirmed with 90 senators voting yes, and nine senators voting no. Ginsburg was confirmed with a 96-3 margin. In the fifteen years after Ginsburg won overwhelming bipartisan support, America slowly declined into the rigid partisanship that is arguably at its worst point today. Among the reasons for this partisanship was the Kenneth Starr investigation into Bill Clinton, one that culminated in his impeachment proceedings late in his second term. Another reason is the Bush vs. Gore election in 2000, one in which the conservative dominated United States Supreme overruled the Florida Supreme Court by halting the election recount in Florida, thus winning the election for Bush. When reports surfaced that Justice Sandra Day O’Connor commented at an election watch party that she could not retire if Al Gore was president, such left many progressives to realize that Supreme Court justices who are supposed to be politically neutral were far from being neutral arbiters of justice. The last reason, I believe, is that the development of news as entertainment, one in which college dropouts like Rush Limbaugh and Sean Hannity have become more important than even highly educated conservative journalists like George Will and Kathleen Parker. Their bombast on radio for six hours a day, and an additional hour of television for Hannity, has led to a period in which Americans view their politics the same as they do their favorite football teams. Meaning, if a candidate or nominee is on their team, that they see no evil and hear no evil. Meaning, that Democrats gave moral passes to the serial philandering and sexual assaulting Clinton, the same way Republicans now give passes to the serial philandering and sexual assaulting Donald Trump. 1. Chief Justice John Roberts–78 yes 22 no. 22 Democrats voted yes, 22 Democrats voted no. 2. Justice Sam Alito–58-42. All Republicans save one voted yes; All Democrats save four voting against. 3. Justice Sonia Sotomayor–68-31. All Democrats and nine Republicans voted yes. Sen. Lindsay Graham, as he angrily noted last week, was one of the nine Republicans who voted yes for Sotomayor). 31 Republicans voted no. 4. Justice Elena Kagan–63-37 All Democrats save one voted yes; all Republicans save five voted no. (Sen. Lindsay Graham, again, voted yes for Kagan). 5. Justice Neil Gorsuch: Appointed by President Trump, Gorsuch was confirmed 54-45. Three Democrats joined 51 Republicans to vote yes, and all 45 Democrats voted no. 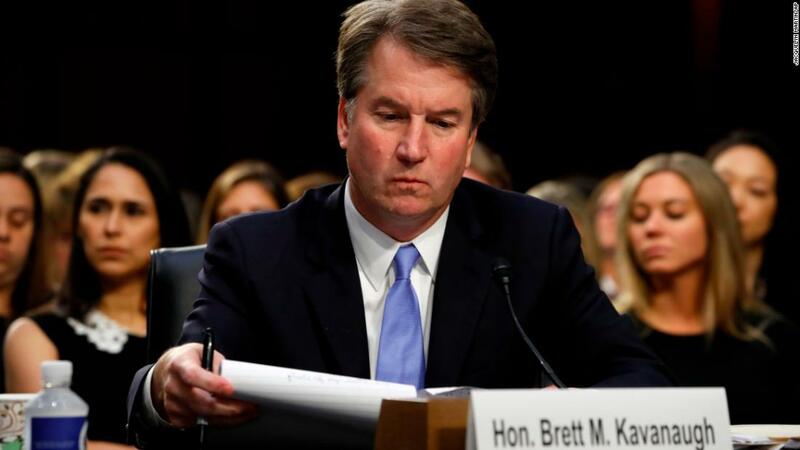 I am not clairvoyant, therefore I cannot predict whether Judge Brett Kavanaugh will be confirmed next week–or not. With the FBI investigation just beginning into allegations of sexual misconduct by Kavanaugh, I will not speculate the ultimate outcome. But I do know that over the last 50 years, how the Senate and the American people delve into the backgrounds of federal judges has become far more partisan, and I have little faith that such will change in the foreseeable future.